Did you know that 28 million Americans suffer from migraines! Are you one of them or do you know someone who does? If so, you understand that these chronic headaches are exceptionally debilitating and, on top of the intense pain, can trigger nausea that makes them even more uncomfortable to deal with (eight out of 10 people who are diagnosed with migraines report experiencing nausea). Plus, nausea makes it difficult to keep down the medication needed to treat the migraine to begin with. 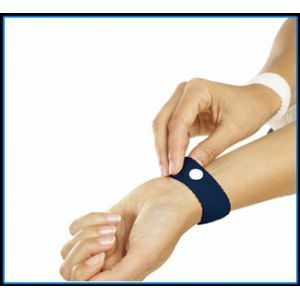 Approved by the FDA, Sea-Band works by exerting constant, gentle pressure on a point on the inner wrist known as the Pericardium 6 (P6) acupressure point. It brings effective relief and can be used before or after the onset of nausea. Sea-Band has traditionally been used to effectively reduce nausea from morning sickness, travel sickness, chemotherapy and post surgery. The all-natural, drug-free, latex-free Sea-Band does not cause side-effects often associated with anti-nausea medication such as drowsiness, disorientation, dry mouth or possible interactions with other drugs. It’s safe for patients taking prescription medications, pregnant women and children. Packaged in a convenient carry-case, they are washable and reusable, and one size fits most. Click here to watch an informative video about how Sea-Band wristbands work. In addition, the company also offers Sea-Band Anti-Nausea Ginger Gum, for fast nausea relief with fresh, uplifting flavor. Sea-Band products are available in the U.S. in Walmart, Target, CVS, Rite Aid, Walgreens, as well as in Canada in Overwaitea, IDA, Familiprix, Guardian and other independent drugstores or pharmacies throughout North America or online at drugstore.com and athttp://www.sea-band.com/shop. Suggested retail price is $10.99 per pair in the US, and $12.99 in Canada. To learn more and to take advantage of special giveaways, connect with Sea-Band on Facebook at www.facebook.com/seaband. One Mommy's Moments reader will win a set of Sea-Bands! 18+ Open to USA and Canada. Ends May 25th 11:59 p.m. Winner will be drawn randomly. All entries must be logged on separate comments to count. LIKE Sea-Band on Facebook and tell them that Mommy's Moments sent you by!! I received a set of Sea-Bands for review purposes only. I was not compensated any other way. I LIKE Sea-Band on Facebook and told them you sent me. I LIKE Sea-Band on Facebook and told them that Mommy's Moments sent me by!! I liked them on facebook (June Lisle) and told them you sent me. I like Sea-Band on facebook and told them you sent me! I 'liked' Sea Bands on FB. I follow Mommy's Moments via GFC. I "like" Sea-Band on facebook. Told them Mommy's Moments sent me over. I am following Mommy's Moments via GFC. I "like" Mommy's Moments on facebook. I like Sea-Band on FB. I "like" Sea Band on FB as Johanna C. and told em you sent me! Like SeaBand on FB and said Thanks!